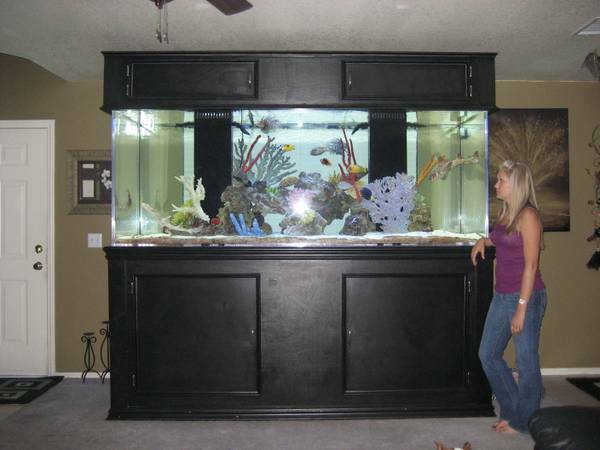 Up for sell is a 560 gallon fish aquarium. This aquarium is custom built. The tank dimentions are 96″x36″x36″. The stand is made of 2×3 steel and wrappend in wood painted black. The stand and aquarium heigt combined is a whopping 93″ tall, length is 99.5″ and width is 39.5″. I have invested a lot of time and money and it could be yours for a fraction of the price. If you have owned an aquarium you know how expensive things are so you will appreciate the low reserve I am offering. Listed below is everything that goes with the tank. Keep in mind, this is a complete system, everything goes. All you need is a big enough space and a crew of friends to help move this into your home. The tank is 5 years old. You have to see this aquarium to really appreciate the size and quality. Its jaw dropping for anyone seeing it when stopping by or especially for the 1st time. They just stare at it for hours. The chiller turns on but doesn’t keep the water cool because of the freon. Local pickup only. 560 gallon Acrylic tank $4,000 all corners rounded, 2 overflows. lighting, metal halids and pc. $1150, you can have just fish or coral reef with these lights, even built in night lights. 1 of 4 ballast needs replacing, you would never know since still have 8 bulbs running and its bright. I have over $12,000 invested so serious inquires only.